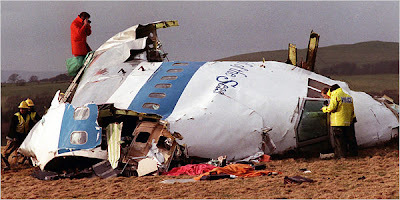 America has expressed their outrage at the freeing of the Lockerbie Bomber Abdel Basset al-Magrahee. “It gives comfort to terrorists all over the world” thundered the Director of the FBI. Oh really, does it just? Let’s just remind ourselves of the case that all this over inflated reaction is trying to obscure shall we? Al-Magrahee was convicted on an unreliable identification by a Maltese shopkeeper and a Libyan CIA informer. He was said to have planted the Pan Am bomb in a suitcase on a flight from Malta to Frankfurt, which went on to London and exploded as it flew over Lockerbie. After a decade of sanctions Ghaddafi handed Al-Magrahee over and he was convicted largely on the hearsay of discredited witnesses and was sentenced to life imprisonment. His release ends his appeal so that the victims families may never really know who was responsible for the bombing. This is all made especially poignant when you consider those CIA drug smuggling rumours at the time of the trial which suggested the CIA used airport luggage to transport drug money and this system was infiltrated by the bomb explaining how it managed to avoid Frankfurt security. I’m sure dropping his appeal gave a lot more comfort to the CIA than it did for terrorists around the world. I hope his final months are peaceful and surrounded by his family. The Iranians blew up the airliner in retaliation for the US cowboys who shot down one from Iran (in case you didn't already know that already). I think it's in the same place as Saddam's WMD's!